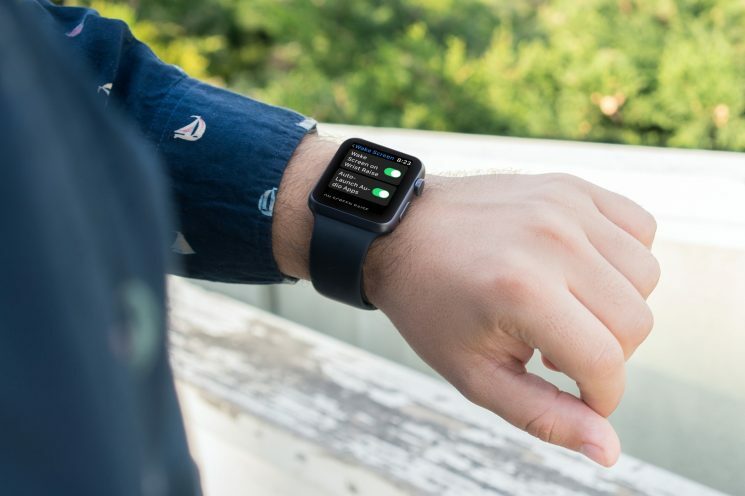 Your Apple Watch screen goes to sleep when you aren’t actively using it. But, there are some convenient features for waking it up that come in handy. Tapping to wake it, raising your wrist, and automatically seeing the last app you opened, are just a few of the things you can do. 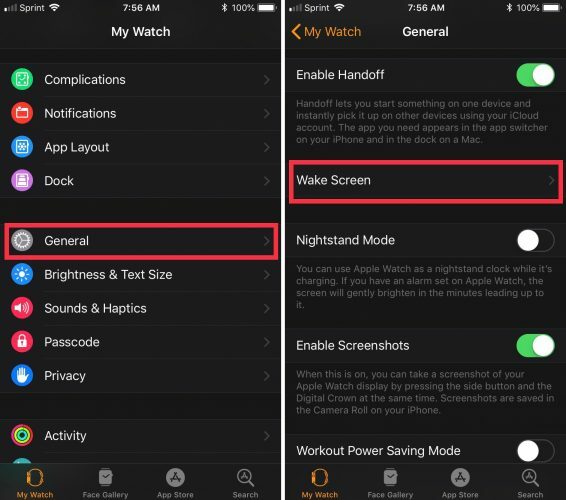 Here’s how to customize your Apple Watch Wake Screen settings. In order to customize the Wake Screen settings, just follow these steps. 1) Open the Watch app on your iPhone or open Settings on your Apple Watch. 2) Scroll down and tap General. 3) Scroll down and tap Wake Screen. Once you arrive in the Wake Screen area, you’ll notice that it’s divided into a few sections. You’ll see these sections whether you’re using the Watch app on your iPhone or the Settings on your Apple Watch. This is the easiest way to wake your Apple Watch. It will automatically perk up and be ready to go when you raise your wrist. Make sure that you have the orientation set up for which wrist you use. Just go to General > Watch Orientation to make your choice. Then, enable the Wake Screen on Wrist Raise option by moving the slider to green. This convenient feature is ideal for those who listen to music or podcasts on-the-go. Instead of reaching for your phone to control the playback, the app will automatically display on your Watch for you to control it there. Just move the Audio-launch Audio Apps slider to green and you’re good to go. And, we have a full tutorial on this feature for more details. This area lets you choose whether you want to see the last app you had open before your Watch went back to sleep. Let’s say you are viewing your calendar and get distracted for a bit. You can set the screen to show the app you were looking at when you raise your wrist or tap to wake it. Just make your selection, whether you want it session-based, time-based, or always and a checkmark will appear next to your choice. If you prefer to tap your Apple Watch to wake it, then you can decide how long the display should stay on once you do. There are just two options which are wake for 15 or 70 seconds. Tap your choice and a checkmark will appear next to it. While there may not be tons of features for waking your Watch, keeping the screen on, and quickly seeing the last app you opened, there really doesn’t need to be. 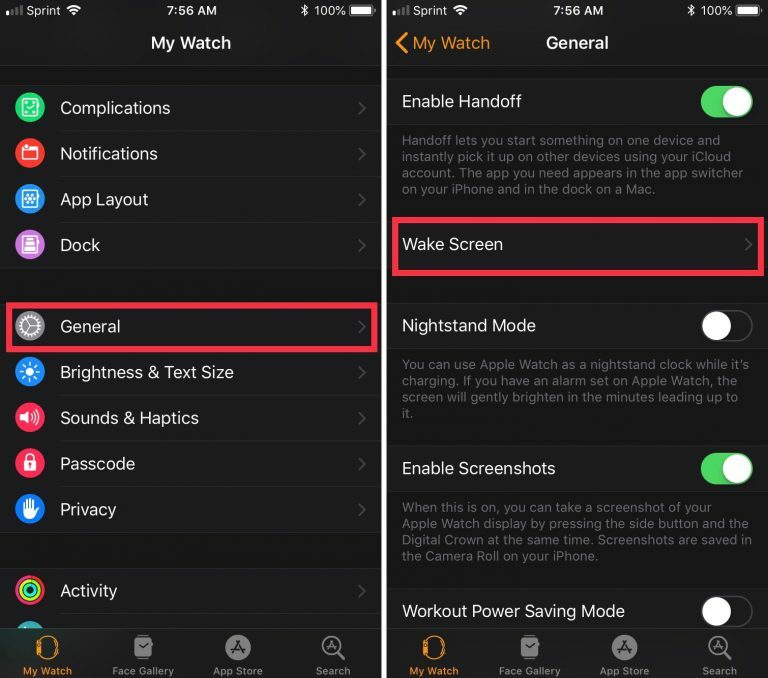 These Apple Watch Wake Screen features should have you covered. Is there something about your Apple Watch that you’re struggling to figure out? Let us know! And, check out some of our other articles that might be helpful for making the most out of your Watch. When you create events in the iOS Calendar app, you can easily set an alert to remind you of that event. But, you’ll also notice that a time for the alert pops into your event alert automatically. This is the default time in your Calendar app and you can change it to suit your preference. 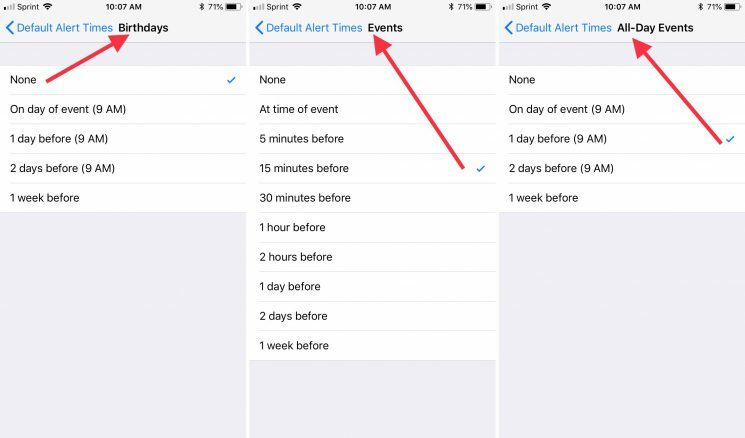 Once you set the default alert time you want, you won’t have to change it when creating the event unless you really need to and here’s how. 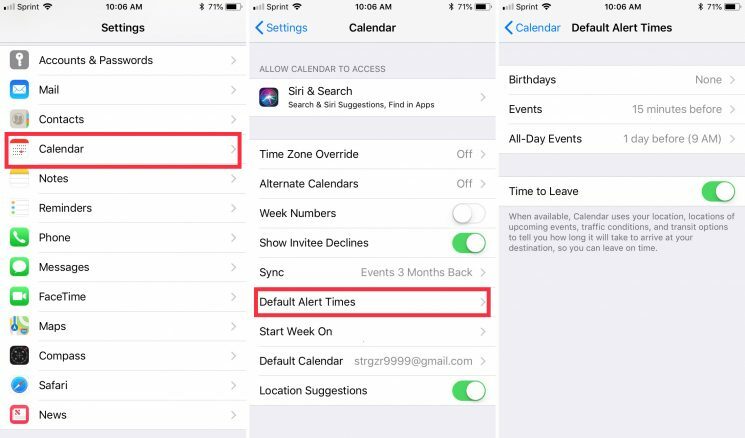 You can easily change the default alert times for birthdays, events, and all-day events in your Calendar app. 1) Open the Settings app. 2) Scroll down to and tap Calendar. 3) Tap Default Alert Times. 4) Choose from Birthdays, Events, or All-Day Events. You can change each one individually. 5) Pick the alert time you want to use. Then, when you return to the Default Alert Times screen, you will see your choice next to the type of event. You’ll notice that the alert times available for birthdays and all-day events are exactly the same. This is because birthdays are considered all-day events. You have more options for regular events like 15 minutes, one day, or one week before. Now, when you create a Calendar event, you will see the default alert set for you. 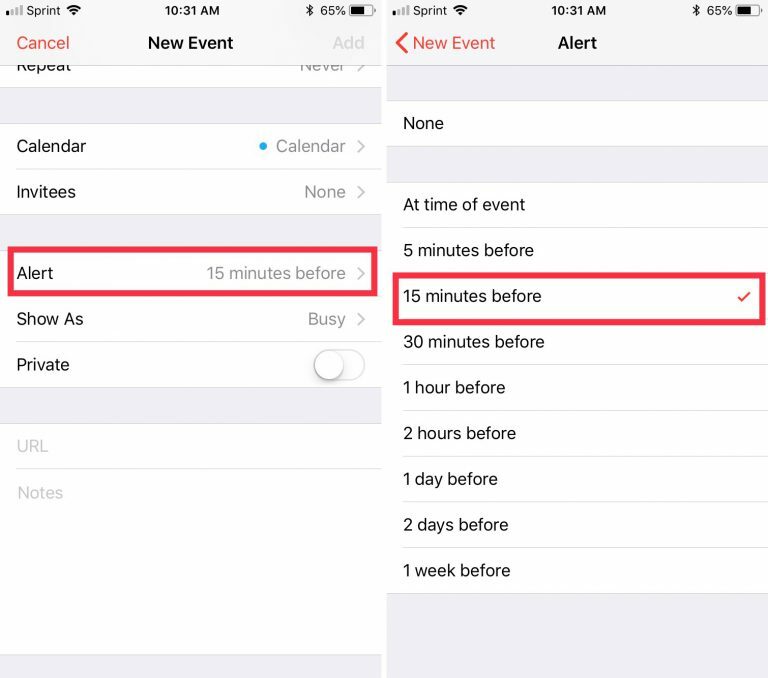 And, if you want to change the alert time for that particular event, just tap Alert and select your new time. You can also create another alert by tapping Second Alert and choosing a time. If you always want an alert one hour before an appointment, one week before a birthday, and one day before an all-day event, these default Calendar alerts are convenient. If you’re looking for additional tricks for the Calendar app, let us know! In the meantime, take a look at these tips for viewing birthdays in the Calendar or changing the Calendar time format on your Mac. Our resident Mac Help guru, Peter Cohen, previously told us about the “Other” storage category on Mac computers and what it catalogs: In short, you’re seeing space taken up by plug-ins, documents, and caches stored by OS X.
It’s worth noting that these files aren’t normally harmful or wasteful to your computer’s system; most are intended to help your Mac run efficiently, and ideally, you shouldn’t ever have to clear out your Other files. Unfortunately, they can quickly clog up a computer low on storage — especially if you’re storing a large number of iPhone or iPad backups. Whether you’re looking to free up space on your hard drive or just want to do some spring cleaning, here are some simple steps to get your Mac free and clear. When Apple added its storage management feature to macOS Sierra, called Optimize Storage, it reorganized what “other” storage is and where it’s located on the Mac. Much of it has been divided out through other categories so it’s easier to find and remove. The 100GB of Other storage I used to carry on my iMac is whittled down to just 5GB. You can still clean out old and unnecessary content from your Mac with macOS Sierra and High Sierra by using Optimized Storage. It’s just a little easier to find those unused files than it was before. A lot of the features of Optimized Storage remove content from your Mac and store them in iCloud. If you’re concerned with how much storage you’re using up in iCloud, you can customize or disable some Optimized Storage features to keep a balance between what’s on your Mac and what’s in iCloud. What’s this ‘Purgeable’ category all about? If you check your system storage graph in macOS, you’ll probably discover a category called Purgeable. This is part of Apple’s Optimized Storage service. When you move your Documents into iCloud (part of the Store in iCloud component) and your hard drive gets low on storage, only recently opened files are kept on your Mac. Older documents are stored in iCloud, while a shortcut icon is kept on your Mac (files are automatically re-downloaded to your Mac as soon as you open them). The Purgeable files are what Optimized Storage will move to iCloud and delete from your hard drive only if your hard drive starts to get full. Purgeable files also include caches and temporary files that used to fit into the Other category, which will also be deleted as your hard drive starts to fill up. Though your Other storage might have been spread out across categories in macOS Sierra and higher, you can still follow the below steps to manually clean up your Mac and get rid of unnecessary files. If you are concerned with how much storage space you have remaining on your Mac computer, you can check its usage folder to see how much space each category is taking up, including Other. Click on your desktop or the Finder icon from the Dock. Select the Apple Menu icon in the upper left corner of the screen. Your Mac breaks down its storage categories as follows: Apps, Movies, Photos, Audio, Backups, and — that annoying, undescriptive category — Other. Now that you know how much space your Other files are taking up, it’s time to reduce their footprint on your Mac. You can start by removing items you don’t need, including caches for your web browser, saved Apple Music streams, and photo previews. A note on deleting cache folders: You only want to delete old and unnecessary files, as current cache files store your preferences. We strongly recommend only deleting cache files from old apps. Click on your desktop or select the Finder icon from the Dock. Select the Go menu in the upper left corner of the screen. Click on Go to Folder. Type ~/Library/caches into the text box. A list of caches from active apps will appear on your desktop. Select the app folder you wish to remove the cache from. Right-click (or control-click) on the app folder. 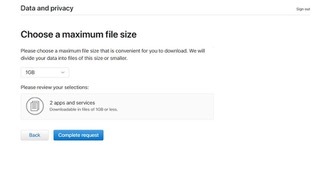 Chances are, your Downloads folder is stuffed with Other-type files, including installer packages, documents, and folders you have already made copies of somewhere else. 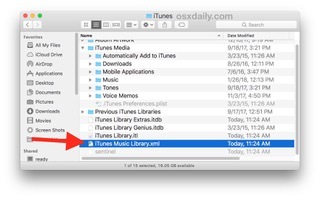 If you want to make some room on your Mac, it may be time to clean out your Downloads folder. Select the file you wish to remove. Right-click (or control-click) on the file. If you want to save a file from the Downloads folder but don’t want it clogging your drive, consider moving it to an external hard drive or flash drive, or uploading it to an online storage option like Dropbox. If you tend to get new iOS devices fairly regularly, you may have unnecessary device backups stored on your computer via iTunes. Backups take up 4-5GB each, on average; there’s no need to hold on to older device backups if you no longer have the device or have it stored in iCloud. While you don’t need any third-party app to “clean” your Mac, there are some very handy system access tools out there that make it easier to regularly remove unwanted files. With CleanMyMac, you have easy access to a list of features that help you keep your Mac free of unnecessary junk. It scans your entire system and recommends files you should delete based on how old they are and whether they are considered unnecessary to your workflow. It’s a lot like Apple’s Optimized Storage, but with a few additional features. My favorite is the recommendation to delete all content related to an application. Sometimes, you’ll end up with a couple of files left behind by an app when you delete it. CleanMyMac provides a one-button purge of everything associated with that app. DaisyDisk scans your Mac and gives you a pie chart that makes it easy to see what files are using up the most space. You can identify files that are in the Other storage category and drag them to the delete box. 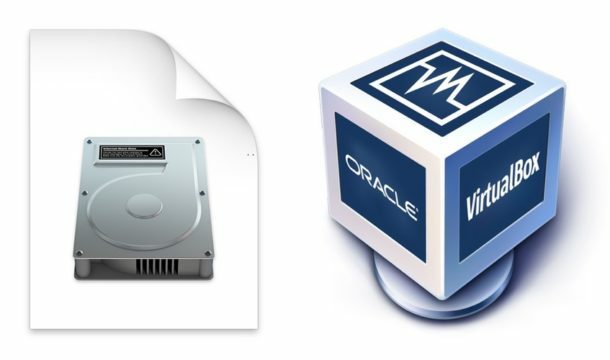 Onyx is a robust Mac system access tool that, in-part, can delete caches, logs, temporary items, and other files that find their way into the Other storage category. Cocktail is another useful system access tool that you can use to clear caches, purge memory, and manage hidden Apple app settings, which might be automatically sending files into the Other category abyss. Still having trouble with Other? Let us know in the comments. 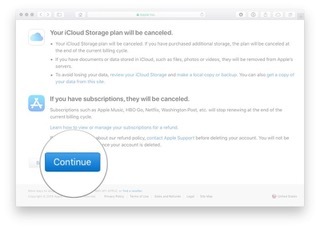 Updated June, 2018: Updated the section on deleting iPhone and iPad backups in iTunes to direct people to the article about doing that. The rest of these steps are still correct. Feel like you need a fresh start with macOS High Sierra? Do a clean install! Downloading and installing a new OS gives you the opportunity to do some major house cleaning if you so desire. If you feel like you’d like a fresh start with macOS High Sierra, you can always opt to do a clean install: Just follow the steps below, even if you’ve already installed macOS High Sierra. Make sure you understand the difference between a clean install and a standard install before you get started. Note: If you are reading this article on the Mac you want to perform the clean install with, switch to another device or print this page before continuing so you can read along as you go. This process will erase whichever OS you’re currently using from your hard drive entirely. That means any files, programs, or documents you have will be deleted. To save your files, put them on an external hard drive or a cloud-based program like Dropbox, OneDrive, or iCloud. If you don’t save these important files off your computer, you will lose them. Before you erase your current operating system, download macOS High Sierra from the Mac App Store. You’ll need a copy of macOS High Sierra to perform a clean install later on. If you don’t create a bootable drive for macOS High Sierra, you’ll have to install an older Mac operating system first and then upgrade to macOS High Sierra afterward. Select Restart from the drop-down menu. Hold down Command-R when you hear the startup chime (or the screen turns black on newer Macs) and keep holding the keys until your computer reboots. Click on Disk Utility in the OS X Utilities selector. Click on the Erase tab at the top of the window. Enter a name for the file to be destroyed (Like macOS High Sierra or something). Select Mac OS Extended (Journaled) from the format list. Step 4: Reinstall a new copy of macOS High Sierra. Click on Reinstall a new copy of macOS. Click Continue again when the installer window appears. Agree to the software terms and conditions. Any questions about performing a clean install? Let us know below in the comments. 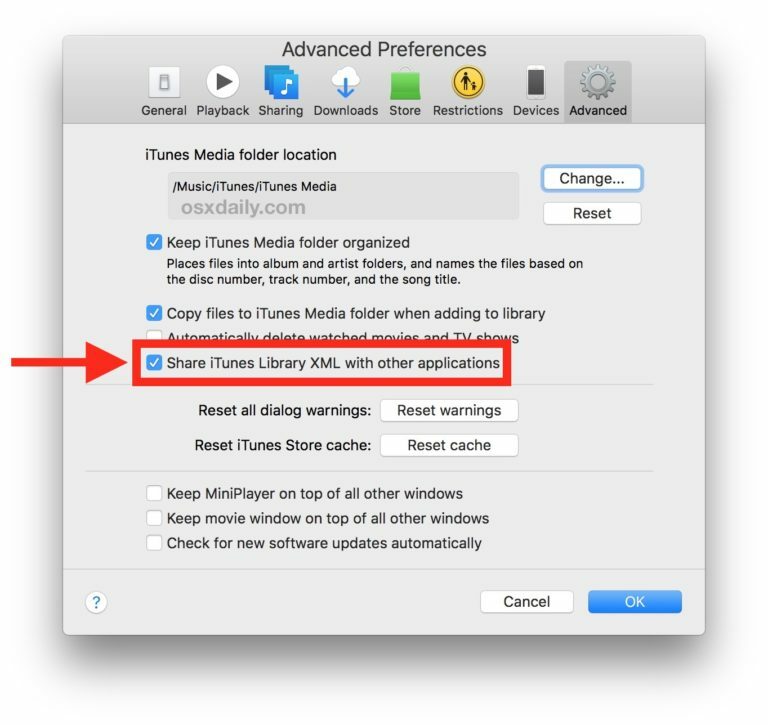 Updated June 2018: These are still the correct steps to do a clean install of macOS High Sierra. Apple Pay offers many security advantages, including single-use tokens and authentication via Touch ID fingerprint scan or pin code. However, if you lose your iPhone or iPad, you’ll still want to remove any credit or debit cards that you’ve linked to it, just to be extra safe. Luckily, Apple and iCloud.com let you do just that secure and, best of all, remotely. Simply log in and wipe your cards away! From any web browser on your computer, go to iCloud.com. Enter your log in information. Under the My Devices section at the bottom, click on the device you’d like to wipe Apple Pay from — you should see an Apple Pay logo next to any device set up with the service. That’s it! 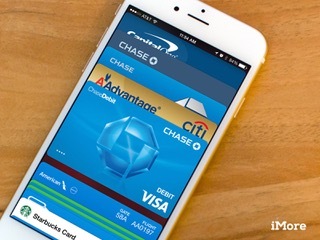 Apple Pay will then be de-authorized and all your cards will be removed from that specific device. Even though Apple Pay can’t be used by anyone that doesn’t have a fingerprint registered on your device, we’d still recommend removing all payment options if your iPhone goes missing. Updated May 2018: Changed the steps to reflect the most recent changes in the process. iMore’s resident gaming guru. Loves playing games from all eras, and still has a working Atari 2600 in his basement. When he isn’t writing about games, you’ll probably find him slapping the bass to his favourite 80s tunes. 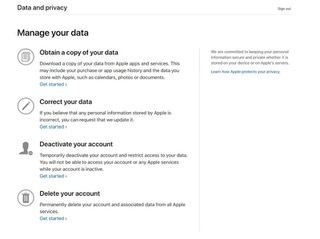 Apple has launched a new Data and Privacy portal that lets you request changes to the data you’ve shared with the company. It also lets you delete your Apple ID and associated data. Here’s how to use it! 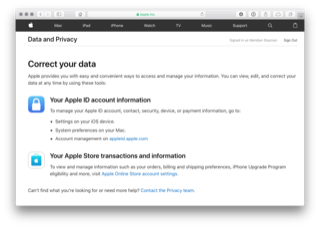 If you’d like to take control of your data (or just get a peek at what you’ve sent Apple’s way), here’s how! Visit Apple’s Data and Privacy portal at privacy.apple.com. 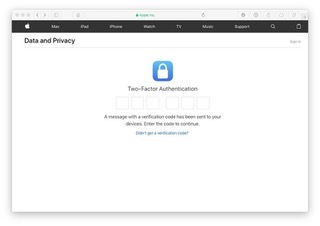 If prompted, enter your two-factor authentication code. 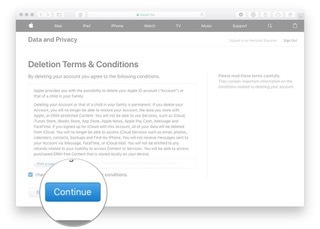 From here you’ll need to decide if you want to make amendments to the personal data stored by Apple or if you want to completely delete your Apple ID and its associated data. Complete steps 1 – 4 above. Click Get started beneath the section labeled Correct your data. 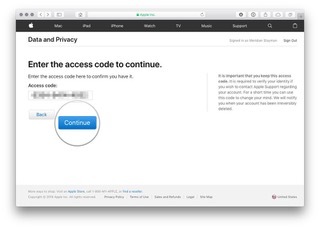 Review the sections to access and correct data related to your Apple ID and your Apple Store transactions. Click Get started beneath the section labeled Delete your account. 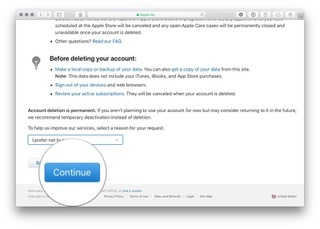 Review the information regarding the deletion of your account. Apple will verify any deletion requests and says the process could take up to seven days to complete. 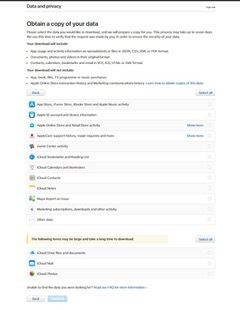 Follow Apple’s recommended steps (back up your data, sign out of devices, etc.) before you delete your account. 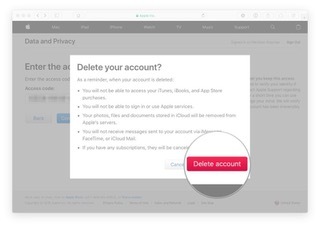 Choose a reason for deleting your account using the pull-down menu. Review the information regarding the deletion of your account (again). Review the Deletion Terms & Conditions and check the box to confirm you’ve read and agree with the conditions. Choose a contact method that will be used to get account status updates. Write down or print out your unique access code. This will be used to verify your identity if you need to contact Apple Support. This code can also be used to cancel the account deletion process. Enter the access code to confirm you’ve actually written it down. Click Delete account to delete your account and associated data. 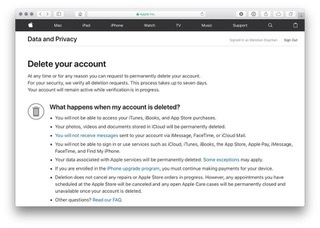 Apple will start the verification process before deleting your account. Your account will remain active during this period. It could take up to seven days for the verification process to complete. 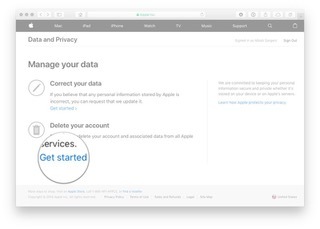 If you visit Apple’s Data and Privacy portal using the account you’re deleting, you’ll see a notification along the right side of the site letting you know that your account is being deleted. If you live in the European Union, you can actually request a copy of your data. Those of us outside of the E.U. will probably gain access to this feature in the future. If you’re in the E.U., here’s how to request your data! Click Get started beneath the section labeled Obtain a copy of your data. Review the sections you wish to download data for and select the box next to each. Downloads will not include app, book, film, TV programme or music purchases, nor Apple Online Store transaction and marketing communications history. Apple will divide your data into file sizes between 1GB and 25GB. Select your preferred size from the dropdown box. 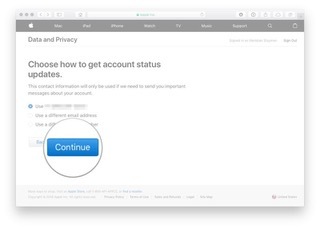 Once your data is ready, Apple will notify you by email at the address registered to your Apple ID. It can take up to seven days to process as Apple ensures that the request was made by you and that your data is secure. Run into any issues using Apple’s Data and Privacy portal? Have trouble deleting your account? Leave your questions and concerns in the comments below or send ’em my way over on Twitter! 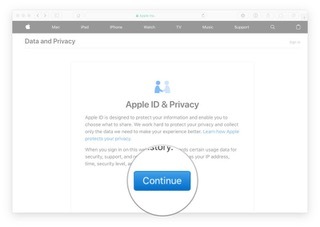 Apple har oprettet et helt nyt privacy-website, hvor brugerne får let adgang til at downloade, slette og redigere i deres data. For at imødekomme kravene i EU’s nye persondata-forordning, GDPR, har Apple nu lanceret et nyt privacy-site, der gør, at du på simpel vis får adgang til alle de data, som den amerikanske gigant har om dig. 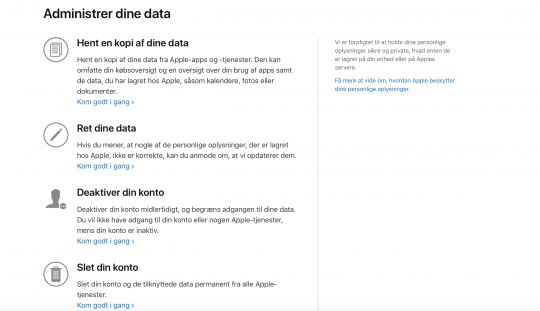 På den nye side kan du blandt andet downloade data, der relaterer sig til din aktivitet i App Store, dine enheders købs- og support-historik og oplysninger om de data, som du gennem tiden har haft gemt på Apples iCloud. 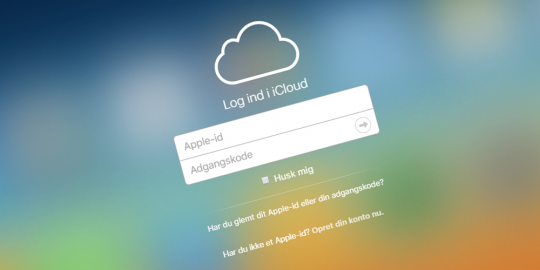 Du skal dog være opmærksom på, at især filerne, der vedrører dine data i iCloud kan være ganske store og derfor vil tage lang tid at downloade. Den nye privacy-side giver dig desuden let adgang til at slette eller deaktivere din Apple-konto, og du får ligeledes adgang til at redigere i de data, som Apple opbevarer om dig. 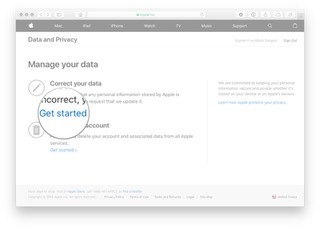 En sletning betyder, at Apple permanent fjerner alle data om dig, mens en deaktivering betyder, at du lukker ned for alle dine Apple-relaterede tjenester, men Apple beholder dine data, og du vil således fortsat have muligheden for at genoprette din konto. I første omgang er den nye side kun tilgængelig for borgere i Europa, men de nye privacy-muligheder vil i de kommende måneder også blive udrullet til borgere i resten af verden. 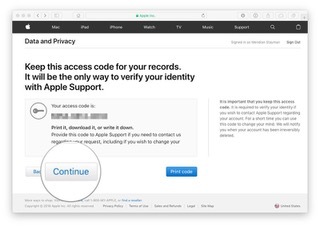 Apples privacy-side har adressen privacy.apple.com, og du skal logge ind med dit Apple-id for at få adgang til mulighederne. 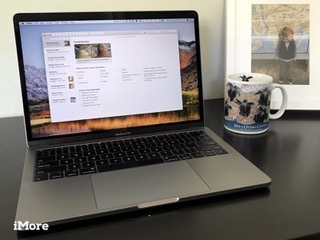 iCloud Photo Library and security: What you need to know! Our photos can be as personal and private as our messages, financial information, and identities. iCloud Photo Library wants to make sure all our pictures and videos are backed up online and available on all our devices. To do that, it moves the bits that make up those pictures and videos from our iPhones, iPads, and Macs up to servers on the internet and then back down to our other iPhones, iPads, and Macs. That means both the transport and the storage needs to be secure so that our content is only ever available to us and us alone. How does Apple keep my photos secure? Apple uses end-to-end encryption to keep your photos safe as they move between your devices and iCloud. As Apple notes on its support site, your photos are transmitted under a “minimum of 128-bit AES encryption”. This means that your photos are given the same treatment as your iPhone backups, iCloud Drive, and your other iCloud-stored content. How does end-to-end encryption keep my photos safe? On a very basic level, it means that when one of your images is being transmitted (uploaded or downloaded), that photo is protected while it’s in transit. This means that if someone were to get ahold of the data for a photo that you were uploading from your iPhone to iCloud while it was being uploaded, they shouldn’t be able to see the actual image. What else does Apple do to keep my photos secure? Each file is broken into chunks and encrypted by iCloud using AES-128 and a key derived from each chunk’s contents that utilizes SHA-256. The keys and the file’s metadata are stored by Apple in the user’s iCloud account. The encrypted chunks of the file are stored, without any user-identifying information, using third-party storage services, such as Amazon S3 and Windows Azure. At a basic level, these standards are very good ways to protect photos and other data while they’re being uploaded, downloaded, or stored. Apple takes privacy very seriously and, as noted above, stores your data chunks without user-identifying information. The company also gives you options for controlling your own privacy. First, on your iPhone or iPad themselves, it’s easy to grant or revoke permission for third-party apps to access your photos. 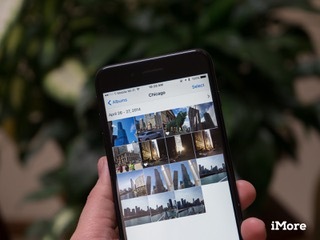 However, if you’ve decided that there are images that you don’t want to keep around, it’s easy to delete them from your iCloud Photo Library. What’s really great is that if you want to delete something, you only have to do so on one device. 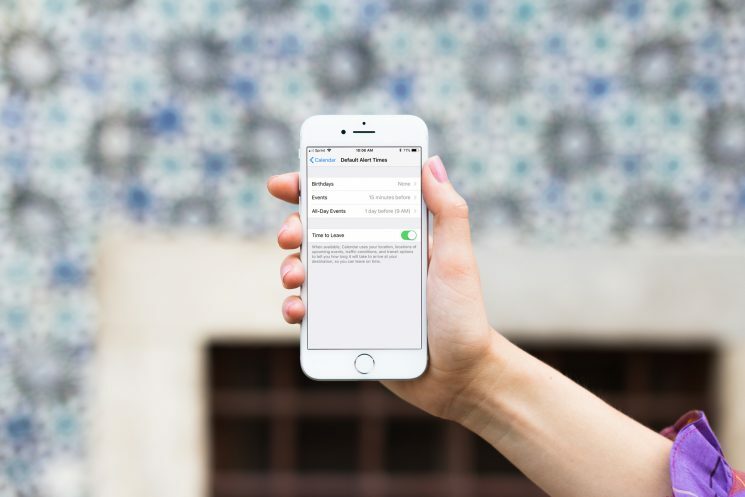 So if you delete an image on your iPhone, it will appear in Recently Deleted not only on that device, but any iPad or Mac connected to that iCloud account. From there, your photo will remain in Recently Deleted for the next 30 days if you change your mind, or you can choose to completely delete it right away. If you have any other questions about iCloud Photo Library and security, let us know in the comments. Updated May 2018: This remains the latest information on how iCloud Photo Library keeps your photos and video safe and encrypted.